I have a confession to make and it may surprise you… I’m not a naturally tidy person. I find it SO hard to keep things tidy- piles of clothes on the floor are a common occurrence and my vanity dresser usually has makeup EVERYWHERE. I’m one of those creative people that despite the perceived mess, knows exactly where everything is. However, I do get to the point when I find this all very stressful and I can’t handle it any more. This last weekend was one of those weekends when I just felt like if I could reorganise our rooms, life would be so much better. The Auckland property market is notoriously heinous, especially for first home buyers so Matt and I currently live at my Father’s house so we can save for a house of our own and travel. We have the downstairs to ourself which has two rooms. When we first moved in a year ago, we had the bed, my clothes and dresser in one room and the other was Matt’s space with a TV, Playstation and couch. It was all a bit of a squeeze however and I was starting to feel like it wasn’t the best use of space. So on Sunday, we spent the entire day cleaning, rearranging and organising. We moved our bed and a chest of drawers into the other room and put the couch into storage which freed up a lot of space. This meant that I could add another rack and spread out my dresses which makes such a big difference- Previously they were all cramped together making it very difficult to get them on and off. With the removal of the bed, it also meant that I could move my dresser further down the room and add another mini shoe rack to cater for the overflow I had. So pretty much the spare room has turned into my dressing room although there is still a area for Matt and his playstation. I know I’ve already done a post about how I store my clothing for a Ask Miss Victory Violet submission but I thought I would revisit it now that I have rearranged things somewhat. My main bulk of dresses I keep out on rolling racks in colour order. It’s definitely a lot better to have everything a little spaced out so it’s easy to get things in and out. Spent all day cleaning and organising so welcome to my closet… Part 1! I have a shelf above the dresses which Matt whipped up for me where I keep the majority of my handbags. In a corner of the room I have a couple of sets of drawers stacked on top of eachother. Petticoat storage is very tricky! I struggled for a long time but thank goodness for this pink toy holder for saving me! I stuff as many of them in there as I can and then the overflow goes into a hanging suit bag on the back of the door. Since my big heavy coats would take up a lot of room on the rail, I have them on a coat stand outside the room. It’s a bit precarious as they are so heavy and the stand is known to spontaneously topple over but it keeps them out of the way and looking tidy. My thinner trench coats are on the end of the rolling rail so as to not overload the coat stand. Moving onto the wardrobe, firstly I make good use of the slated doors. I strung rope through the slats to give me something to clip my hair flowers to. On the inside, I have a tie hanger which I use to hang all my belts from. Inside the wardrobe I keep my separates in the middle so I can have another set of drawers at the bottom. There’s nothing much exciting in the drawers, mainly just excess cardigans, PJ’s and other random items. The rail extends beyond the doors probably another metre on either side. Because this area is harder to get to, I keep items there that don’t get worn as often. So on the right side is all my evening dresses and on the left is anything that is out of season or items that I’m not really wearing anymore. Now for probably my favourite corner! Shoes and Accessories! I have a giant shoe rack thanks to Briscoes and the ability to be able to stack multiple shoe racks on top of eachother. I group my shoes by brand typically especially since I like to see all my colourful BAIT shoes all together! The great thing about this shoe rack is that the horizontal rails are not on a angle like some can be. This means that I can use the top two tiers as storage for hair rollers, handbags and my giant tiki shoes that are too high to be anywhere but the top. My accessories wall is the newest addition. I’ve been wanting a better way to store everything and finally got round to making these boards over the weekend. I’ll be posting a DIY on these very soon too! I made a black one for all my sparkly statement jewellery and a pink one with extra foam underneath so I could use it to pin my brooches to. My Dresser is where I get ready in the mornings and have drawers full up makeup and hair stuff. As much as I try to keep this clean and tidy, rushing to be ready for work in the morning can leave it looking like a tornado has blown through. And finally my headscarves! Hanging them this way was inspired by a vintage shop in Belfast who had all their headscarves hanging on the stairwell balustrade. It’s been a revolutionary way to store them for me, I love seeing them hanging all pretty like this and makes it very easy to get the exact one I am looking for. I am going to do my very best to keep everything as tidy as possible. It’s going to take a lot of discipline but it will be worth it to be able to enjoy such a gloriously tidy room! Are you like me? Do you struggle to keep order in your bedroom or house? What helps you maintain tidiness and what are your favourite wardrobe storage tricks? I love how you stored your petticoats! My collection is growing but my space is not so you gave me a wonderful tip! I also like the way your head scarves are strung, right now all mine are on one bathroom towel hook and it takes forever to pull the right one out. 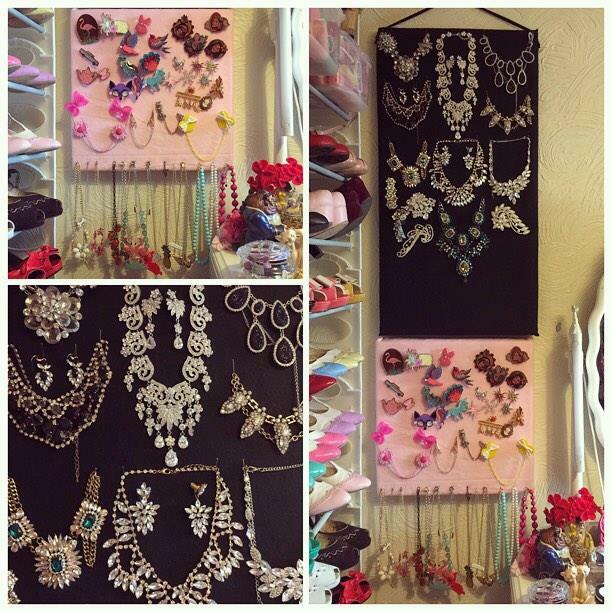 I also use boards for my hair flowers and bows and I found a nifty multi -pouch hanger that holds a lot of my jewelry. But my shoes stay in the boxes and are stacked precariously in a corner of the closet so I may be on the lookout for racks like yours soon before the avalanche happens! You have made great use of your space and I hope soon you and your husband find the home of your dreams! I tend to be clean and tidy except for my headscarfs and scarfs in general! I need a better way to organize them. Beautiful closet space! Very nicely done! One tip though, as a professional wardrobe stylist, I would highly advise against hanging your sparkles like that. Over the months/years the weight of the jewels will cause the part that hangs around your neck to break. Vintage sparkles & non vintage costume jewelry should be stored laid flat in a cool, dark place (I store mine in numerous small boxes) with acid free tissue paper keeping the gems from touching each other. Not all tissue paper is “acid free” so I ordered mine special on Amazon. The acid can discolor your gems. If they lay on each other they can become discolored & make some of the gems dark also. That way you will get the most life out of your jewelry & it will last you many, many years. I love your blogs & I’ve benefited a lot from your beauty posts! Started doing your lipstick trick & I love it! Thanks for all your knowledge & I hope my two cents helps you out too. I have this dream of color coding my attire but I never do it – I think I just now it will be hard for me to keep it that way!! But it always looks so nice when I see others do it! If you need to purge a captain or birdie dress i will gladly take it off one off your hands! I use old cocktail / martini glasses and champagne bowels for my hair flowers – clipping them around the rim with bobby pins in the middle. And I have a couple what are dessert dishes at my boyfriends, so I add brooches to the bottom ‘plate’ section. I’ve recently made a cork pin board into a way of storing my brooches. It’s lovely to have these things out on display and easily seen to choose from!